Tired of Obstructive Sleep Apnea? Learn about the purpose of and setup involved with a Sleep Study. You must download Macromedia Flash player to see this video. Educational curricula for both physicians and technologists. NBA star Shaquille O'Neal may be the new face of sleep apnea. In partnership with Harvard Medical School's Division of Sleep Medicine, The Boston Celtic is being treated for moderate Sleep Apnea. At the insistence of his partner, the 350 lb. O'Neal recently underwent a sleep study and was given a CPAP device to treat his condition. 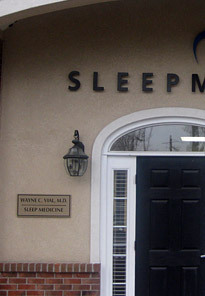 For over 20 years SleepMed has been the only practice in South Carolina devoted entirely to the diagnosis and treatment of all types of sleep disorders. Based in Columbia, SC, SleepMed inc. is the nation's largest provider of sleep and EEG diagnostic services and a major provider of therapy devices for patients all over the United States. Each of our centers is supported by highly-qualified Sleep Technologists who have an extensive experience in performing various sleep tests. Our centers use state-of-the-art technology, allowing us to monitor brain waves, breathing patterns, muscle activities, heart rate, eye movements, snoring activity, and blood oxygen level during sleep to ensure an accurate diagnosis. More than 70 million people in the U.S. including children currently suffer from sleep disorders, including difficulty falling asleep, frequent nighttime awakenings, and daytime fatigue and sleepiness.